Why Summerhouse24 Is Famous for Contemporary Garden Rooms? Contemporary garden rooms are becoming a more and more popular choice in the UK to expand the room of the main house for a large variety of purposes from a garden office to a comfortable garden lounge or a sauna, a fitness room or just simply a place you can fully make your own without having to care about styles or rules in the main house. As a result of the increased demand manufacturers have begun to expand their portfolio of contemporary garden rooms with lots of different sizes, designs, and floor plans. Nowadays it is nearly impossible not to find the perfect solution that checks all the boxes of necessities and options and at the same time decorates your garden with a modern design that is a pleasure to look at. If you look at the selection of garden rooms at Summerhouse24 you will find buildings in modern contemporary design from as small as the Mini Hansa Lounge fully complete with a veranda, a double door at the front and a single door to the veranda all with double glazed floor to ceiling windows, a bright inside, made of 44mm bright shining planks of Northern Spruce with just 9m2. Available for well under £3,900.00 but already very well suited for an artist’s workshop, a garden office or a contemporary garden lounge. The range goes up to 40m2 of space for example with the Large Hansa Office fully suitable as an office for a larger company with six to eight workstations or to rent out as a family holiday home. 70mm walls and double glazing offer a very good insulation to that contemporary garden room which can easily be adjusted for all-year-round use. You will surely find a garden room that fits perfectly into your garden space and once you have made your choice you can customize your garden room as much as you like to make it your very own individual realm. 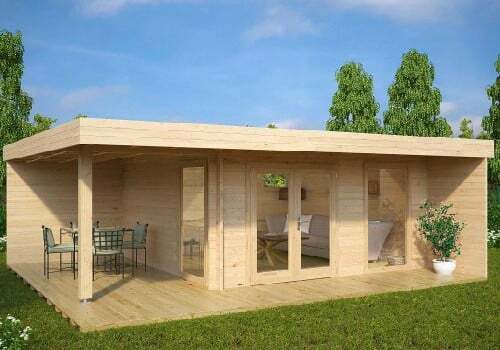 Contemporary garden rooms have been a very fast growing trend over the past few years. One of the reasons besides their usefulness is surely also their designs which are fully able to enhance your garden from an arrangement of plants and beds into an inhabitable space for everyday life and at the same time serve as a statement of a contemporary individual style.